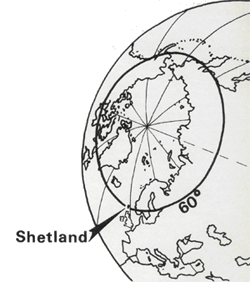 Shetland is a group of islands out in the north sea on the same latitude as the south tip of Greenland. It is so far north, the sun hardly sets in mid-summer. It’s sometimes called “the land of the midnight sun” . This is not the same as “the land where the sun always shines” The weather in Shetland is “changeable” A tourism boss once put it succinctly “If you don’t like the weather here, stick around for ½ an hour and you’ll get something different” It is cold and pretty windy, (look at the UK weather chart on the telly) though not as wet as the highlands and the west of Scotland. As people, Shetlanders are trusting individuals who are perplexed by folk from down south who avoid talking to strangers and worry about having their stuff nicked. Shetlanders talk to everybody and there is no point in nicking stuff as its easy to know who’s done it. Most of the money in Shetland comes from fish and oil, Income from tourists doesn’t figure highly so you don’t come across the rip off mentality you might in tourist hot spots. Shetland is not a cheap place to get to. Many of you reading this article will probably give up all aspirations of northwards travel as soon as you see the prices on the Northlink Ferries website. Northlink is the only passenger ferry operator with a monopoly of the market. 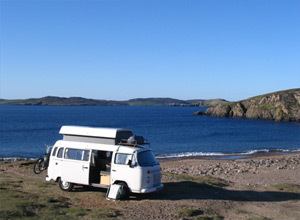 You can take a campervan to Shetland and won’t be charged any more than a car but take a look at what that costs! And then we have the most expensive fuel in the UK –a right liberty considering they extract the stuff a few miles out from the shore. Ireland, Skye or even the Outer Hebrides are all much cheaper to get to. And then, how long do you want to spend at sea? You can boat it to France, and even Orkney in less than 3 hours. Shetland is 12 hours, yes 12 hours away. By the way ignore your sat nav or AA route finder. You don’t travel to Shetland from Scrabster in Caithness, you sail from Aberdeen on Scotland’s east coast – not so far to drive but still 540 miles from London. Have I put you off? If not then here are some web links for further information about Shetland , how to get there and where you can find a campsite with a hook up and toilets etc.. 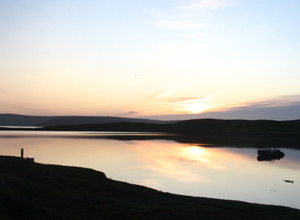 The true essence of what Shetland offers is its scope for really wild camping. As long as you ask politely, don’t obstruct, let your dog loose on the sheep, leave gates open and tidy up your mess, people will welcome you and you will find you can more or less park up anywhere that’s handy. This entry was posted in Road Trips. Bookmark the permalink.